On Killgore Adventures Wild River Tour you will see the deepest most rugged part of Hells Canyon. 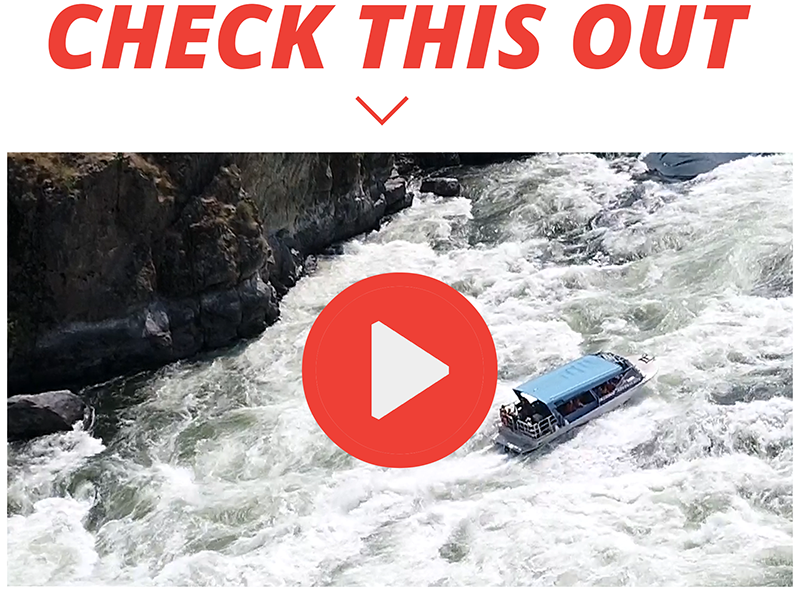 Our world-class jet boats will take you through all of the Wild River section and the Natural Preserve area and through all the biggest whitewater rapids in Hells Canyon. The tour includes stops at the many historical and scenic sites, endless wildlife sightings, lunch, beverages and a stop at the end of the tour for a swim on the beach. Our Hells Canyon Jet Boat Tours are the bread and butter of our river adventures. Come and see what all the rage is about. Steelhead, wild sturgeon, and trout can be found in our Hells Canyon river systems. We have fun family fishing trips that will wow even experienced fishermen! Looking for a place to stay? We have a list of recommended places that include, Motel, Hotels, and camping. Enjoy the rush of the wild river on a guided whitewater rafting excursion in Hells Canyon. The thrill of conquering the rapids is unforgettable. Our jet boat tours are the #1 adventure activity to do in Idaho! Experience class 3, 4, and 5 rapids from the comfort of your seat. A RIVER ADVENTURE YOU WILL NEVER FORGET! We’re always coming up with fun new things to share with you. Check out our blog to find out more about our tours, Hells Canyon, and life on the river. There’s no better way to explore Hells Canyon than with Killgore Adventures. With years of experience, our river outfitters have created a one-of-a-kind experience that’s sure to leave you feeling amazed from start to finish. Our river adventures can be enjoyed through whitewater rafting trips, jet boat tours, fishing trips, and more. Explore one of Idaho’s most remote and scenic landscapes on your next river adventure with Killgore Adventures! Take your entire family on an adventure in Hells Canyon National Recreation Area they will never forget!